Slow Progress in Martial Arts Training? Are you formally studying martial arts at a school, or are you self taught? Whether you are studying at home or at a martial arts studio, (or both), you know that it’s going to take devoted practice, to get really proficient. To be frank, everyone who studies martial arts improves their self-defense skill … to some degree. By virtue of diligent practice, sheer boring repetition, most practitioners of the arts do improve. And since they are study martial arts, their ability to defend themselves also improves. Unfortunately, many quit before they show marked improvement, and those who do stick with it learn at a such slow pace, that their martial arts aren’t of practical use. Rather than following this slow and arduous path to self-defense mastery, you need to take learning into your own hands. In the ebook “Become the Martial Artist You Were Meant to Be By Taking Charge of Your Learning,” I talk about building up the number of good techniques you can execute. Then you pare them down to the most efficient. You, over a period of time, construct a system of practical martial-arts techniques. You won’t devise your system overnight…. Even if you are willing to put in the time, (I have been with my current style for 25 years), you may feel the need to make practical use of your martial arts training, now. * Learn to make each punch count. If you had truly devastating, knock-down punches, then it would only take one solid hit, right? * Learn to pass from kicking distance to punching distance quickly. Your first self-defense move is a low kick — your weapon of greatest reach (kicks) to the closest target (knee). After the kick, you need to break into punching range in an instant. * Develop the ability to find the ‘right’ targets. If you can’t reach the target that will stop your attacker, then you won’t be able to defend yourself. 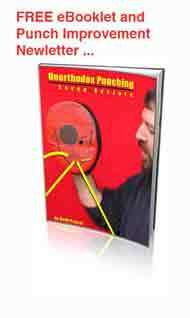 So, we know how important punching is to many aspects of martial arts and self defense. Sure, we could talk kicking, wrist locks, and even weapon self defense. (Write me for suggestions of these other martial skills). But having an effective punch is of paramount importance to your self defense training. 96 out of 100 people who read this article, will go back to the same old practice habits. The other four will take steps to improve their punches — improve their martial arts and self defense training.